1-1/2 hours east of Omaha Nebraska and 1-1/2 hours west of Iowa City. And just 1-1/2 hours SW of Cedar Rapids and Waterloo. We operate our hot air balloons seven days a week, with balloon flights scheduled twice daily, weather permitting. When you book with us, you fly with us! Full Time PRO Balloon Ride Operator! Call us at 515-265-2402 for more information! Hot air balloon ride Gift Certificates are always available and make wonderful gifts for friends, family and loved ones. Put someone on cloud nine by giving them the "Gift of Flight"! The breathtaking experience of a hot air ballooning adventure will last a lifetime. Hot Air Balloon Flights are offered in Central Iowa on a regular basis. Depending on which way the wind is blowing will determine our launch area. We fly either over Des Moines or just south of Des Moines or south of Indianola Iowa on beautiful Lake Aquabii with our ride balloon. Des Moines, Iowa City, Indianola, Creston, Council Bluffs, Grinnell, Waterloo, Cedar Falls, Cedar Rapids, Waukee, West Des Moines, Ottumwa,Oskaloosa, Ankeny, Ames, Ft Dodge, Washington, Davenport, Carlisle, Hartford, Albuquerque, New Mexico, Dayton Ohio, Maryville, Tennessee, Omaha, Nebraska, Galena Illinois, Moline Illinois, Knoxville, Tennessee, Chattanooga, Tennessee, Minnesota and San Juan Puerto Rico and our new favorite spots Saint Jean-Sur-Richelieu in Quebec, Canada and Leon Mexico as well as the Phillippines! We are also attended an event in Bao Tao, China! 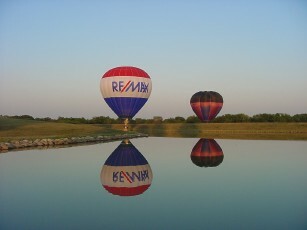 Special Hot Air Balloon Adventure Flights from other exclusive locations in Iowa are available for a premium. We can even fly from your property. All we need is 200 feet by 200 feet for launch and you and 3 of your friends or family can have your own exclusive flight! Call us at (515) 265-2402 for details and pricing. Des Moines or Indianola or Your Location Today! Here in the Midwest, the hot air balloon 2018 flying season has been a bit strange due to the winds and the weather! The winds have taken us to areas that we have never flown before. The weather has made flying interesting to say the least. Beautiful cool mornings and warm afternoons and hot air balloon rides in Des Moines or Indianola are on the menu this winter! We have flown in -10 degrees Fahrenheit and up to 95 degrees! We have two 17.5 Million BTU Burners above our heads, so staying warm will not be an issue! Cool weather presents wonderful visibility and views of far-off landscapes. Summer flying also presents beautiful views of the changing views of the landscapes of Iowa. As always, a hot air balloon ride in Des Moines or the Indianola Iowa area, or even at the place of your choice, is the perfect way to view nature's magnificent splendor from above. Spring flying offers a wonderful chance to get away on your own balloon flight. Be sure to reserve your hot air balloon ride in advance to ensure your preferred flight date is available. We recommend booking your preferred balloon flight date in advance to guarantee date availability. 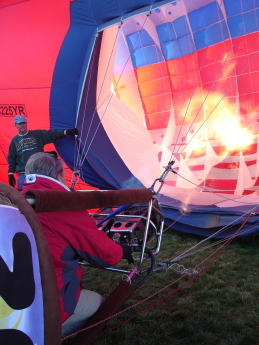 Chief Pilot Dan Campbell (in Red Jacket in basket) inflating the US Flag Balloon for a morning flight at the Albuquerque International Balloon Fest in Albuquerque New Mexico. The Balloon Federation of America! Burnie the "Little Devil" Special Shape Hot Air Balloon! New for Z-Balloon Adventures!! Meet "Burnie the Little Devil" Balloon! The new special shaped "Burnie the Little Devil" hot air balloon by Aeromagic Balloons is our first "special shape" balloon. "Burnie" has been up and flying since May of 2006. By combining man's earliest form of flight and hot air ballooning - with the most recent advances in technology, we have a flying piece of art and technology rolled into one! At the giant height of nearly 125 feet, "Burnie the Little Devil" is one of the tallest hot air balloons registered in North America. 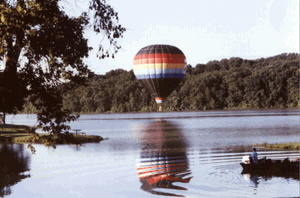 A normal generic hot air balloon will stand about 70 to 80 feet tall. "Burnie the Little Devil" is one of the largest special shape balloons in the entire world! The enormous arms extend out to wave at the crowds as "Burnie the Little Devil" flies over your head. The envelope fabric alone weighs 475 pounds in its carrying bag! 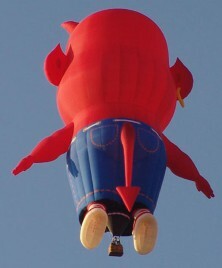 Pilot Dan Campbell will be in command of "Burnie the Little Devil" balloon for the 2009 World Tour. Dan is also very proud to be associated with the US Flag Balloon "America One" and Space Shuttle PATRIOT hot air balloon team as an additional pilot. Dan will be the pilot of "Burnie the Little Devil" in Albuquerque New Mexico from October 9th through the 10th at the Albuquerque International Balloon Fiesta, which is the World's Largest Balloon Event! Come on out and say Hi! 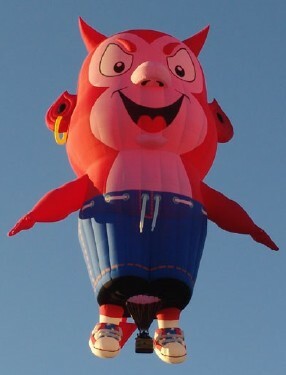 "Burnie the Little Devil" special shape balloon is available for hot air balloon festivals, airshows and other special events around the U.S. in 2008 and beyond. For more photos, booking information and the latest news and event updates, be sure to visit the home page of the "Burnie the Little Devil" special shape hot air balloon team. 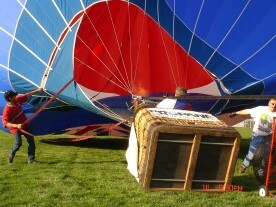 Depart on a hot air balloon ride in Des Moines or Indianola Iowa! Corporate Hot Air Balloon Advertising: Capture the eyes of your target audience with the effectiveness of hot air balloon advertising. Balloons are one of the most cost effective way of advertising. Ballooning Basics: Who, What, When, Where, Why, How... Anything you ever wanted to know about hot air ballooning in Des Moines or Indianola, Iowa but couldn't find anyone to ask! Frequently Asked Questions and much more about hot air balloons. Get Involved: Become a hot air balloon ground crew member and possibly earn a free ride! History Lesson: Find out how hot air ballooning came to existence with a brief history of the sport. Balloon Links: An assortment of quality links devoted to ballooning US. Hopefully this website proves informative and spurs your interest in the amazing world of ballooning. Join us for a hot air balloon ride! Or call us at 515-265-2402 for fastest service! If you have a flight date in mind already and would like to schedule a flight directly, please tell us so we may may reserve that date for you.Gift Certificates can be mailed directly to the person you are purchasing the ride for, or we can mail it to you so you can present it to that special someone. You have the option to choose your preferred delivery method or stop by our office and pick it up yourself if you are in a big hurry. Please note: Gift certificates will be mailed the same day we receive your order. Late day orders will be mailed the next business day. We must individually prepare each certificate and confirmation letter, so please allow 45 minutes to an hour so that we may print up your Gift Packet if you are going to pick your packet up. Please call us at (515) 265-2402 or email us at balloon@dwx.com so we can help you make that special someones day!